Right across the world in zones of violence and disruption In Place of War is building a creative movement, a networked and powerful platform that allows voices to be heard and opportunities to be created. They are opening up new creative spaces; sharing stories, fostering radicals and fomenting creative resistance. From the grassroots up, a community of artists and collaborators are exchanging their ideas, their insights and their passions to bring about change in their communities. This October In Place Of War are curating an event series called Culture | Conflict | Change that will showcase some of the world’s most groundbreaking artists, activists and creative entrepreneurs from sites of conflict, post-conflict and humanitarian disaster. Myself and theatre art practitioner, Nikki Mailer will be delivering a TED style talk at this event not only discussing the importance and necessity of hearing diverse and marginalised voices but also why our latest project from Outside The Frame is so important! Entry is free but please email shereen@inplaceofwar.net to register. Date: Friday 21st October 12.30-5pm. And more to be announced. Watch this space! 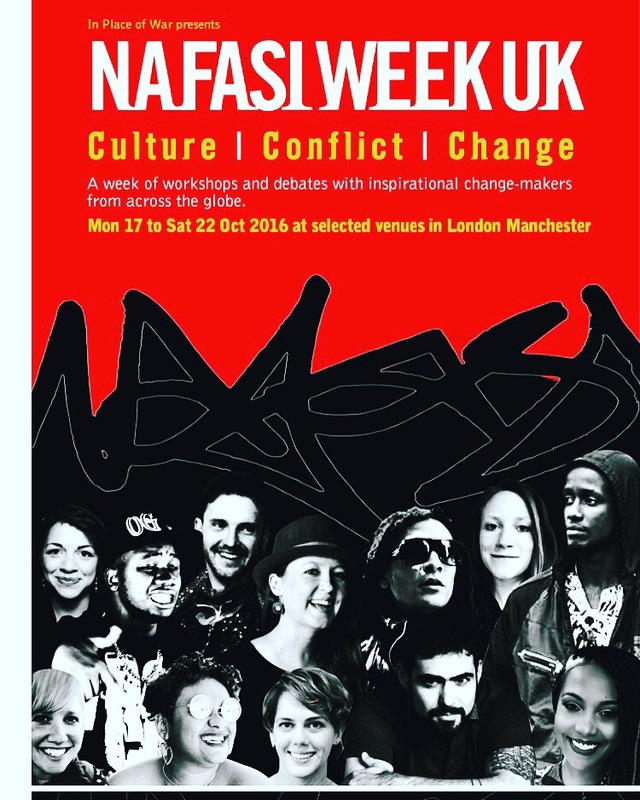 This entry was posted in Uncategorized and tagged #InPlaceOfWar #activism #socialchange #grassroots #voice #story #writing #word #spokenword #grassroots #politicalchange #politics #cultureconflictchange #NAFASIWeekUK on October 15, 2016 by Hafsah Aneela Bashir. Organised by Cultureword at various venues such as Chapter One Books, Central Library, MadLab and Contact, the event was rich with conversations. The programming partners – Manchester Literature Festival and Black Gold Arts Festival worked seamlessly together. The panellists bought their amaxing insights and experiences to the table to include: Adam Beyonce Lowe, Bny Hermitt, Samira Sawlani, Yvonne Battle-Felton, Anjum Malik, Courttia Newland, Dr Jennifer Makumbi, Haamid Sharif, Keisha Thompson, Sanjay Lago, Shruti Chauhan, Benji Reid, Dawn Walton, Javaad Alipoor, Yolanda Mercy, Christina Fonthes, Erica Jarnes, Louisa Uchum Egbunike, Pasha A Ab, JJ Bola , Col Bashir, Charlotte Maxwell, Desiree Reynolds, Radikal Queen, Ian Bobb, Tariq Mehmood , Kavita Bhanot, Nii Parkes, Sandeep Parmar, Cee Bangura, Yomi Sode; and the exhibiting artists, Sarbjit Kaur, Ian Bobb, Bethany Hermitt, Afshan D’souza-Lodhi, Christina Fonthes & Thabo Imasiku and myself! The monologue performers in the evening festival included Lucy Miller-Sheen, Claire Hynes, Christina Fonthes and Seni Seneviratna followed by the phenomenal poet, Lemn Sissay, ever the charasmatic orator. It was an excellent end to a powerfully informative day! This entry was posted in Uncategorized and tagged #panda Arts #cultureword #commonword #bawc16 #arts #contacttheatre #madlab #blackgoldartsfestival on October 10, 2016 by Hafsah Aneela Bashir. 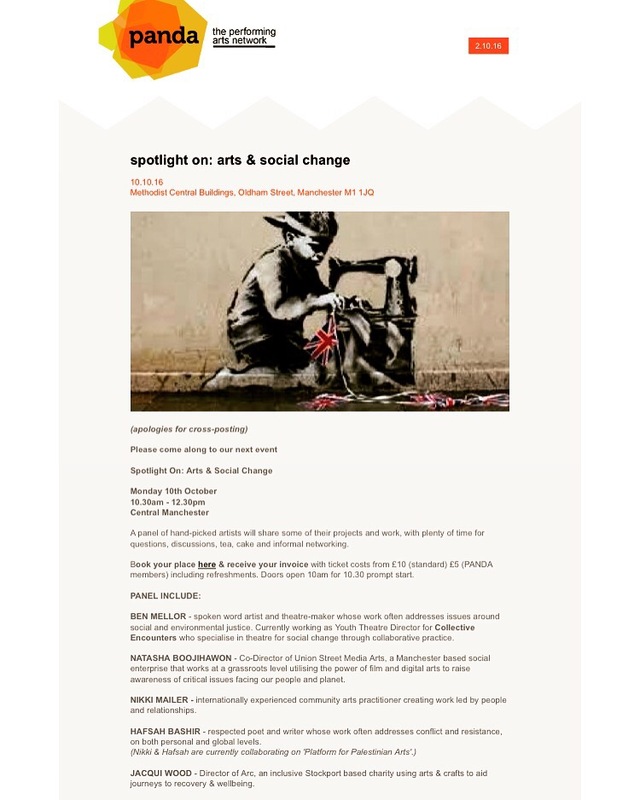 I am delighted to be sharing the panel with various artists who work within the community to actively inspire social change. This event is delivered by PANDA in partnership with Union Street Media Arts as part of the AGMA funded Creative Breaks programme. 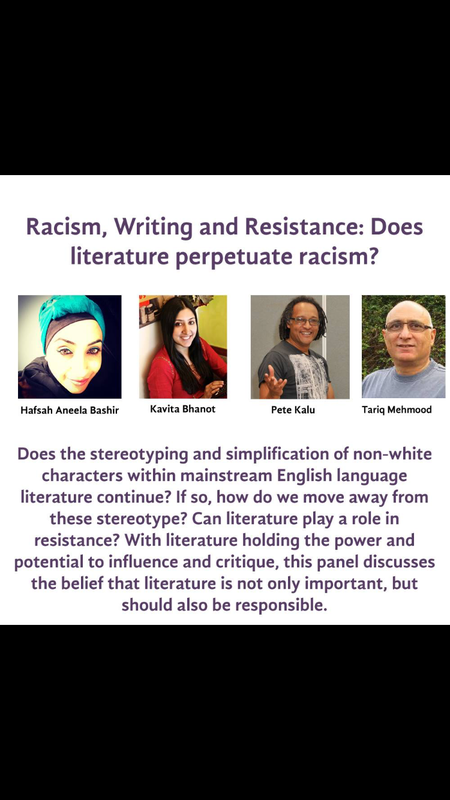 Come and join us if you’re free for a lively debate! This entry was posted in Uncategorized and tagged #pandaArts #creativebreaks, #youthwork #socialchange #grassrootsmovement, activism, arts, creative breaks, panda arts, poets, social change, writers on October 9, 2016 by Hafsah Aneela Bashir. 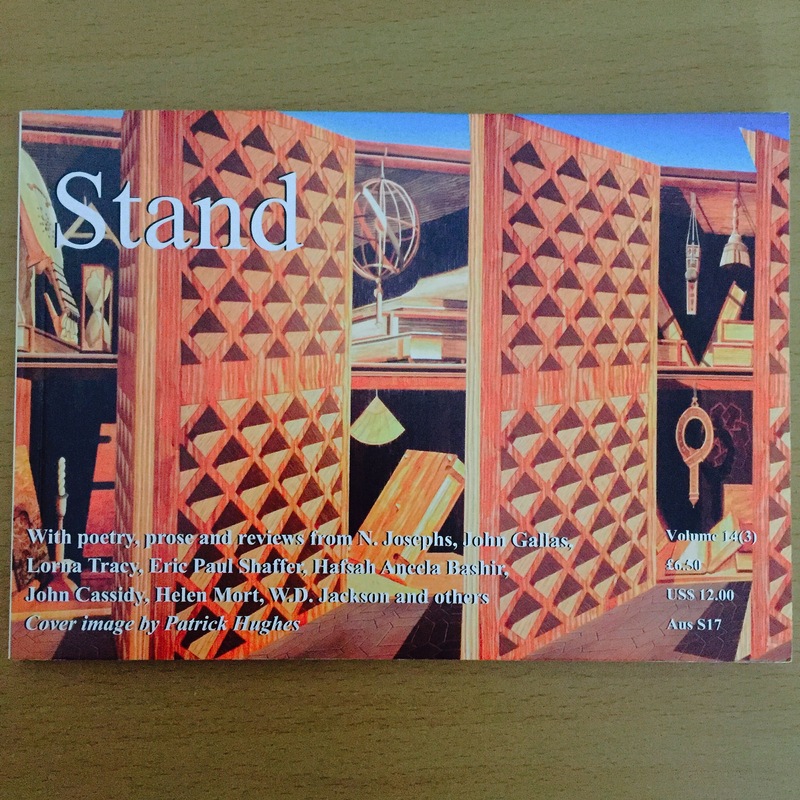 Six Poems – Stand Literary Magazine! This entry was posted in Uncategorized and tagged #flashfiction #cultureword #commonword #stories #writing #writersofinstagram #writingcommunity #poemsporn #poems #flashfictions #leedsliterarymagazine #stand, narratives, poetry, stories, writing on October 5, 2016 by Hafsah Aneela Bashir.